We want you to have fun creating a character to play at Dystopia Rising Georgia. To help you create them, we've provided some guidelines below to help you make your designs. Open Strains can be played by anyone at any time. If you want them to have local flavor, we have some guidelines to help you. Approval Strains can be played, but you may need some guidance to help the costume and background match the requirements. Banned Strains can't make Georgia their home branch, but we welcome visitors of these Strains form other locations! Some concepts are not appropriate for your characters under any circumstances, so we'll start there. Characters physically or mentally under the age of 18. Dystopia Rising: Georgia is an 18+ branch of Dystopia Rising. This also applies to the types of characters who call this branch their home - those concepts must have a physical and mental age of 18 or older. Slaves and Slaveholders. 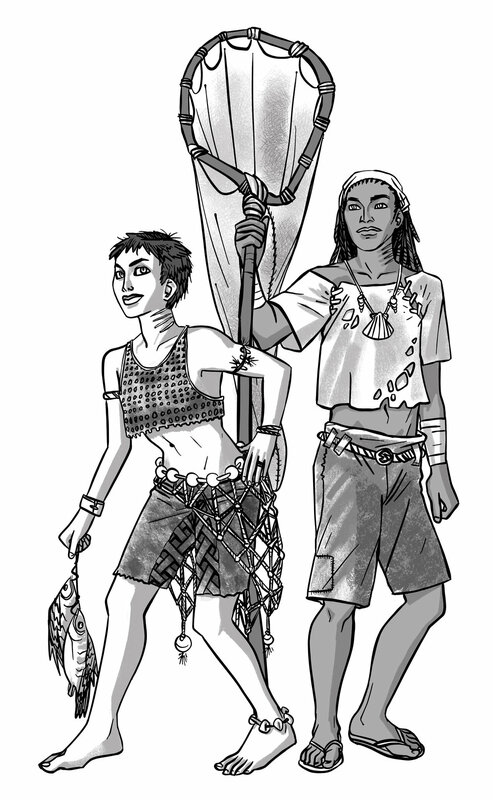 While there may be many characters in our setting who were once slaves or have had experience with slavery in their backgrounds, no character in our setting may currently be enslaved to or enslave any character or non player character. Background experience and involvement with slavery should ideally be grandparents or further back. Slavery, in particular chattel style slavery, has a horrific history in the United States and we have chosen to minimize the impact of this concept in our local setting. Concepts strongly influenced by Indigenous American cultures. These are real world populations with a rich and beautiful culture who have been oppressed historically and into the present day. No concepts emulating the native peoples of the United States will be allowed for play. For example, Natural Ones from this area are the descendants of survivalists or people of backgrounds beyond indigenous tribe members and their descendants. The Unborn of the region do not have a known or active connection to Mayan or Aztec ancestors. This includes being thoughtful when designing headgear, wearing face paint, and implementing armor or costuming. Characters that are a parody or use parody of real world religion or spirituality. People of all religious backgrounds are welcome to play at Dystopia Rising: Georgia and we wish to respect those beliefs. Please do not include caricatures of modern day religions and beliefs in your character concept. Characters that use the Confederate flag in their costuming. The Confederate flag is an emotionally charged symbol for many. We have chosen to exclude its use or reference in the Dystopia Rising: Georgia setting. Please do not include this in your costuming in any form. Background concepts that include sexual assault. As mentioned in our Ingredients List, this theme is not one explored in any chapter of Dystopia Rising. Please do not include this type of experience in your character’s concept or background. These Strains can be selected by any player at the Dystopia Rising: Georgia Chapter. We want you to have full creative freedom to create the character and the story that you want to play within these strains. If you’d like a little guidance or some local flavor, we’ve included some information to help you get started. Players are encouraged to submit a background before their third event. Baywalkers of the southern swamps and Rum Coast grew in the rising waters of the southern Atlantic coastline much like their northern cousins after the fall of society and its trappings. They have long fought for succor in the swampy tides and waters of the coast. Constant underdogs but with powerful numbers these people have aligned themselves to become nigh irreplaceable to the local smelting enterprises, gunsmiths, and farms. Irons have worked hard to provide a safe and free home for their children, many now adults with no direct exposure to the hideous practice of slavery or the battles and conflict that brought them autonomy of their own lives. These nocturnally and subterranean-oriented folk live primarily in the ruins of pre-fall urban centers (now ruined hellholes). Several great Hives vie for control underground in the dead of night within the urban wastes. They are often at odds with the strains in Georgiabama due to both their eating and social habits. Mericans’ unrepentant stubbornness has raised many small communities from nothing but mud. In many ways, they tie the more isolated peoples in the region together with their gumption, their labor, and their money. The force of their personalities have been known to seal as many binding agreements for trade and truce as they have started skirmishes and wars. That’s a pretty good track record among other folk of Gerogiabama. Faith runs deep in Georgiabama. Among the leadership and infrastructure of the region’s major religions Accensorites are often found helping perpetuate the word of their belief. As highly visible and highly energized followers of their Faith they often find homes in the communities of other strains within houses of worship. They can also be found helping build strong and unbending flocks of Accensorites who believe strongly in their righteous way of life. As the descendants of survivalist preparedness communities, such folks were armed and ready to disappear into the woods and wilds when the apocalypse came knocking. As the years past and resources dwindled these survivors found their interest in complex ordnance waning as their tools rusted and machines needed for their upkeep wore out. Changing and adapting, their strong interest in weaponry moved onto the blade and the bow. Their renown in their use is usurped by no other community. Remnants can be anyone or no one in particular. Often shunned by the parents that gave them life they move among communities as migrants, vagrants, and pilgrims. Forever hoping to come to a place or people that will welcome them home. Often seen in the trappings of their birth people, chosen people, or those they’ve most often associated with a Remnant stands out because of their otherness.This can be represented in both garb and physical abnormalities and unusualness. 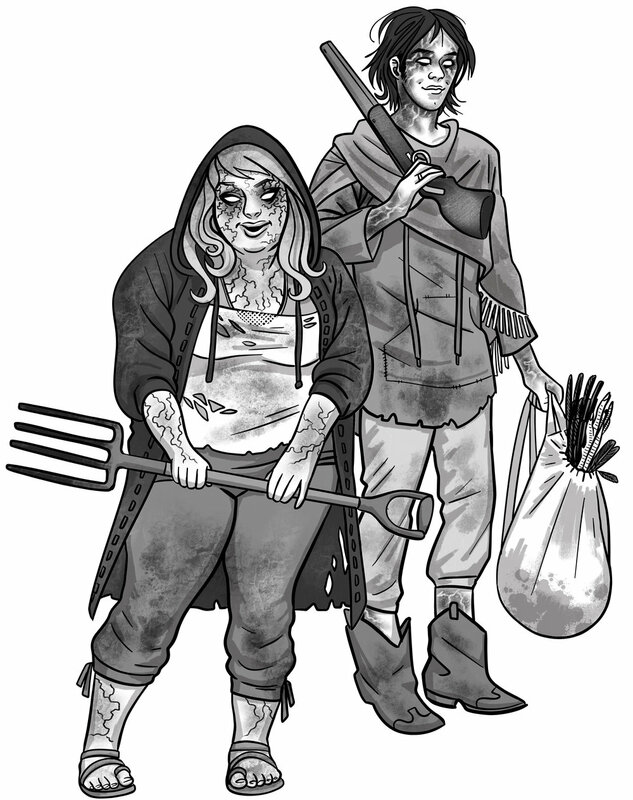 These diverse people are masters of survival and carnage in both the urban wastes and the wild swamps of the region. Their adaptation to these environments have led to the diasporic peoples of this strain developing wildly different lifestyles and cultures. Those in the wastes of Resurgens often associate closely with Yorkers of the area and cover their faces to not be mistaken in battle and conflict. There are rumors of a local settle of deeply insular Retrogrades who don’t wear masks and shun outsiders. The traders and travelers of Georgiabama are most often these nomadic clans of folk. Moving from place to place in great wagon trains, on foot, or in cargo boat flotillas. Their backgrounds and influences are diverse while being deeply tied to their trade routes,the people, and goods they work with most often. Many Vegasians migrate to southern Georgiabama because they themselves have been freed from the chains of oppression, often having been abused and controlled by people of their own strain. The Purebloods of the region have forgone most direct ties to the peoples of this culture (though indirect and “unofficial” ties may exist). Still, it’s hard for other citizens of the region to trust them. Often called Thrashers in these parts local Yorkers were born in the wake of radioactive fire much like their namesakes to the north whose cities didn’t flood once the crater stopped smoking. Most local Yorkers hail from from what was once Atlanta which is now known as Resurgens. Thrashers often have close ties and allegiances with local Retrogrades and often quarrel or fight against Lascarians among the urban ruins. These strains are also commonly found in the setting of Dystopia Rising: Georgia, but due to their complex costuming requirements and cultural background, costuming and concept must be reviewed by the Dystopia Rising: Georgia team before coming into play. 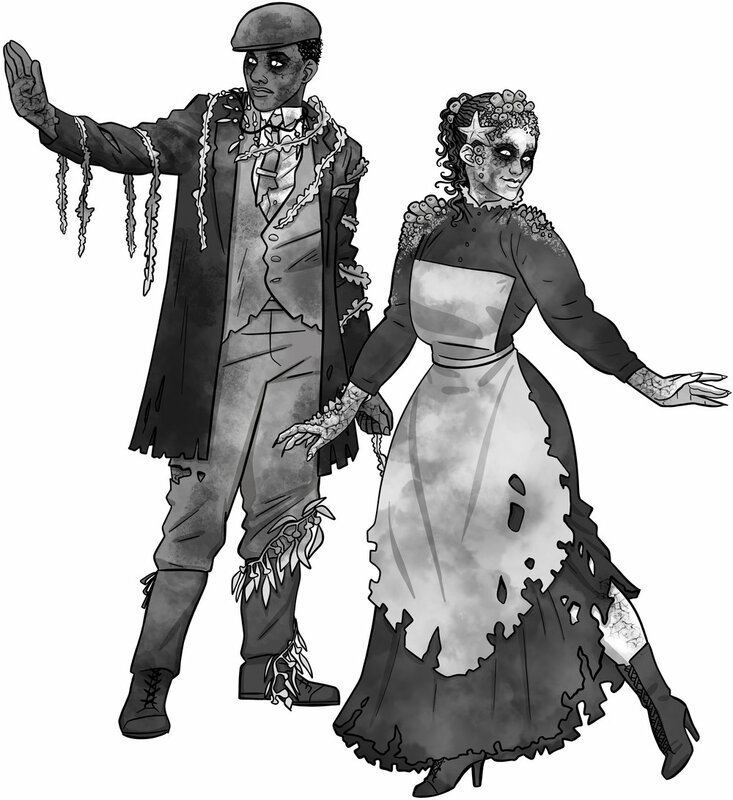 There is no AP cost to play these strains or a required time frame in which the player must have participated in Dystopia Rising: Georgia events. While the seas are their home, the Salt Wise have flourished in the southeastern and southernmost Georgiabama regions by joining with other strains in developing a robust trade network along the coasts. Over time, this network has moved further inland making it more common for Salt Wise to be seen travelling in the farthest regions of the swamp. Though they generally avoid the hardened, dryer lands and radiation of the ancient cities, they work with other strains to obtain supplies for maintaining their flotillas and fleets. Salt Wise also act as the eyes and ears of the local Guild. Important Notes: Saltwise cannot refresh in 40 Watt at the 12 o’clock hour due to the site’s distance from the ocean shore. While Saltwise can visit inland and freshwater areas they don't live in the area directly around 40 Watt and find their way home to the ocean between gatherings. As descendants of counterculture communes tucked into quiet places off the beaten path Red Star in these parts are commonly of the Artisan bent. They trade amongst themselves and occasionally outsiders to maintain their small close-knit settlements. The majority of these small cells communicate with and look to the Cell of the Guidestones for leadership, a group of philosophers and intellectuals who help the various cells keep on the path of survival while working on research and development to aid with that endeavor. Important Notes: Red Star of Southern Georgiabama have more in common with their local neighboring strains than they would with any foreign governments across the oceans. They are driven, utilitarian folk who look after each other and strive for self sufficiency. It is unlikely that they would own or have even seen Russian/USSR or Cuban regalia, nor would they have their accents. The first generation of Semper Mort in Georgiabama are tidy intellectuals. Most were recovered from an underground facility beneath a pre-Fall medical university. This compound has grown into a settlement known as Mercy and is home to all kinds of people of many strains. The Semper Mort govern the settlement closely and offer any who wish to settle in their community shelter, food, and trade training in return for regular blood donations. The first generation have been awake long enough to sire children who have come into adulthood, and there are far more naturally born Sempers in the region than there are the awakened. While many tend to stay closely bound to their parents and their medical research, those who have chosen less studious lifestyles are often unaware of any details of the research done in Mercy’s facilities at all. Important Notes: Semper Morts of this region all hail from a settlement called Mercy where concerted efforts to recover historical knowledge has helped them regain their intelligence,society, and culture. Wild children or the young of mind are unheard of in this area. At this time only concepts for naturally born Semper Morts concepts hailing from the Mercy settlement and compound will be accepted. These strains require an approved background and 150 AP expenditure prior to entering play. These strains require extensive costuming, should have ties to the Dystopia Rising: Georgia story and region, and their players should have adequate knowledge of the genre. As the world fell several massive international para-military corporations rose to try and beat back the undead and forge strongholds in the blighted wastelands. One place chosen as a strategic military base was Fort B, a place full of military contractors and their families organized under a strict hierarchical meritocracy. Genjians of Fort B are well-trained and regimented, highly educated, and place a strong value on their families and their community; a holdover of it being all their ancestors had left in the crumbling world. They are typically outfitted in practical tactical gear. Clearance must be granted to leave Fort B for longer than short missions and clearance is difficult to achieve (there needs to be a reason for it)which accounts for the low Genjian population outside of Fort B. Most don’t want to leave in the first place. Important Notes: All Genjian characters in this area must be stationed at Fort B. 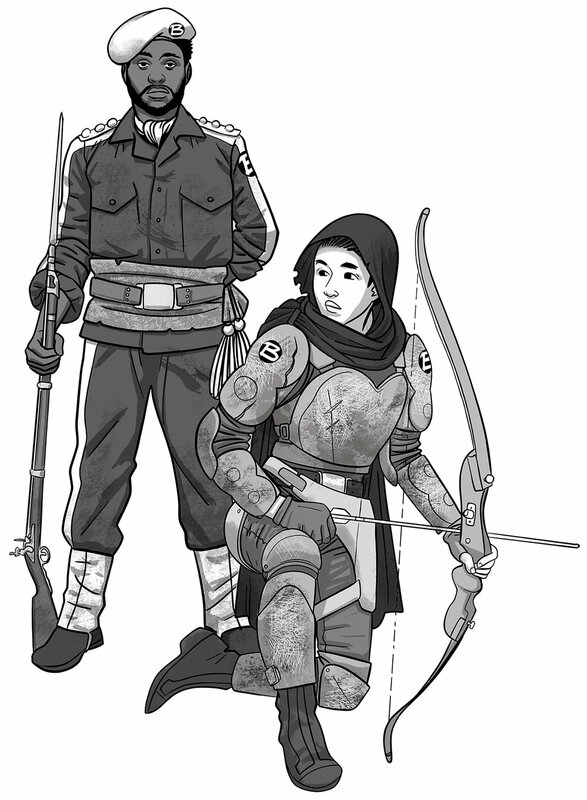 Local Genjian culture and aesthetic strays away from almost all reference to historical feudal Japanese culture, East Asian cultures in general, and is strongly influenced by paramilitary organizations and more ‘modern’ aesthetics from various and diverse international militaries. No one really knows exactly how the Unborn came to Georgiabama. Even those that have initiated trade with them have learned very little on the subject beyond that they believe the Unborn have always been there. Their largest encampments are in the lush wilds in the northernmost reaches of Resurgens’ urban wastes that have flourished since the Fall. 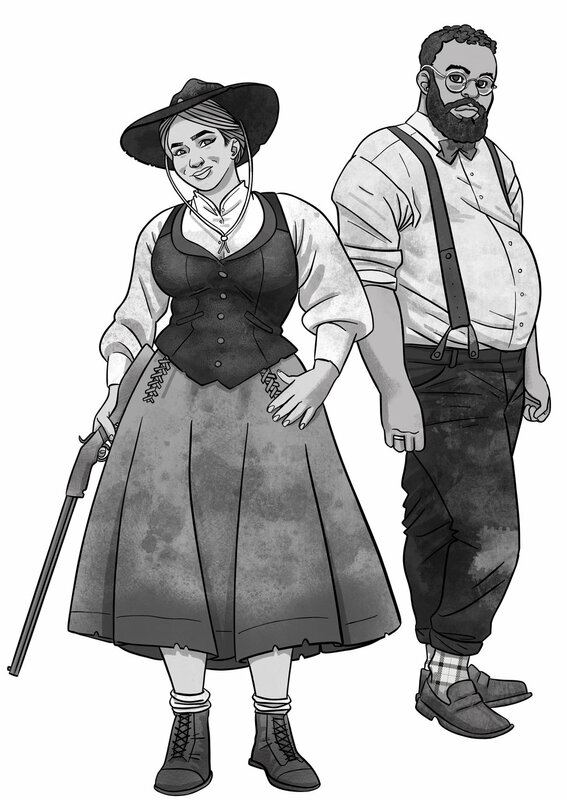 From out of the lush and dangerous wilds they have cultivated unusual herding animals, hive insects, and other, stranger farming techniques. This sustains them while they scavenge the wreckage of a past society for usable and adaptable tools and technology. As these unusual and uncommon folk actively straddle the divide between the natural and the wreckage of the past, their appearance can be motley, haphazard, and built to meet their specific needs, skills, and interests. They have tamed the wild lush forests north of the urban wastes in building their homesteads and villages but also have the skills to move beyond the forest’s edge to venture into the urban wastes. They find what they need to grow and survive as a people in a vicious environment. Important Notes: Character background concepts may not include membership in the Wisened caste. It is important to remember that this strain has some of the most complex and high maintenance costume requirements of all of the strains in Dystopia Rising. Rare Strains are the most limited and difficult to portray in the Dystopia Rising universe. Rare Strains require Dystopia Rising: Georgia team approval to play prior to a game event and players looking to play a Rare Strain must have attended game for at least four months before applying for play. They also require a submitted background, the expenditure of 300 Assistance Points, are restricted by branch caps, and are subject to review to make sure they are being played and costumed in theme. Additionally, players should consider this character their "Main" rather than an "Alt" so it is your primary focus in the game since there are so few of them available to play in the Dystopia Rising: Georgia. The Full Dead that emerge in the Georgabama region find a much warmer welcome than in many other areas. The Pure Bloods of the City on the Hill view the ability to host a Full Dead in pre-fall style as the ultimate status symbol and go to great lengths to attract and keep them in their homes. Of course not all Full Dead accept the myriad of increasingly desperate invitations and may choose to live alone in isolated areas, keeping their own company, or take up fully aquatic lives, trading chiefly with the area’s Saltwise. Full Dead are both disconnected from but integrally possessive of their image. Their clothes are all they have left of their past lives and past identity. Important Notes: Full Dead in this region are from a variety of eras and backgrounds having been reawoken from their final resting place. Who they were in their previous lives may not be connected to their identity in the present, but they wear their history. While they can be from many eras they may not have references to the American Civil War in their background. Solestros and their extended families are known to have direct ties to many businesses, farms, and in some cases strong relationships with the Pureblood families of Georgiabama. Many clans have aligned themselves with the 40 Watt Club against their own brethren, others act as stewards for the richest Pureblood houses of the region, and others as the leaders and soldiers of their armed mercenary forces. The Modern Solestro dresses to impress their clientele while also being more than capable of doing the work themselves. Picture the manager at a business being dressed and presentable to interact with the clients or guests while also not being encumbered by their clothes enough that they couldn’t help behind the scenes when things get busy. Important Notes: It’s vital to remember that Solestros are not Purebloods. They do not have the widespread influence and resources that Purebloods do but often do have strong local influence in specific industries, businesses, and communities. Concepts pledged to Pureblood Houses in various roles or as self-determined business owners and working folk in the Georgiabama are sought for the Solestros in this setting. While characters of these strains are welcome to travel into our game from other Dystopia Rising chapters, they are not approved for creation at this chapter. This is primarily based on the style, focus, and themes of the DR:GA game. These strains are not appropriate to our setting will not be allowed to call this chapter their home. These well to do families are incredibly self-isolating and not partial to travel outside of their homes. If anything they are more likely to have someone else do any sort of work in regions outside of their comfort zone on their behalf. While Diesel Jocks are present in this region they are highly aligned with their with own kin, and often have adversarial relationships with other strains and settlements in the region. They are very often unwelcome outside of their own claimed territories. Hailing from the far north, their presence in the southern reaches of Georgiabama is practically nonexistent.